Tlatelolco today is the Plaza of the Three Cultures. (It should be four according to our tour guide and some of the material I studied for this article. Scholars are still uncertain and the Jury is still out. I have trouble reconciling the conflicting stories, dates and spelling. Tlatelolco has a number of claim to fame and history, I will return to these later. The Plaza of the Three Cultures contains the excavated ruins of the great pyramid, second largest in the city, and one of the oldest colonial churches, dedicated to Santiago (Saint James), patron saint of the conquistadors, and it is surrounded by modern office buildings and government-built housing projects. Under the excavated ruins, according to scholars, archaeologist and our tour guide is another set of ruins. The best I can find out the Toltecs, came before the Mayans, who seemed to be the forerunners of the Aztecs. The Toltecs built cities as large as any in Europe at that time. They built Teotihuacan (Sun and Moon Pyramids NE of Mexico City) and Tenochtitlan, which is today's Mexico City. The Toltecs ruled the Mexico Valley some time between first and eight centuries A.D. The Aztec civilisation who ruled a mighty empire in Mexico during the 1300's and early 1500's centred on the Valley of Mexico, a huge, oval basin about 2,300 metres above sea level. Its high altitude gave it a mild climate. Their religion demanded human sacrifices. The city of Tenochtitlan the capital of the Aztec empire was built on some islands in the middle of a large lake, (Texcoco) canals and aqueducts criss-crossed the city and the islands were connected with causeways and linking each other and the mainland. In 1519, the Spanish conquistador, Hernando Cortés landed on the east coast of Mexico and marched inland to Tenochtitlan (Today's Mexico City). Cortés reorganised his army and began a bloody attack on Tenochtitlan and Cuauhtémoc, the new Aztec leader in early 1521. The siege lasted seven months. Tenochtitlan was cut off from external food supplies, the aqueduct supplying the city with water was destroyed. The Spaniards destroyed the city, because the only way to hold any part of the city for Cortés was to raze it. The Aztecs, hungry, thirsty and stricken with smallpox, made their last stand at the former great market place of Tlatelolco. Cuauhtémoc was captured, ending the Aztec resistance and empire. The Spaniards destroyed most of the previous civilisation's pyramids, temples and houses and built their own churches and buildings from the stones. There are inscribed stone monuments at the Plaza. One describes the pre-Columbian history of Tlatelolco, which was an independent Aztec city until it was absorbed by Tenochtitlan in the 15th century. The second tells of Cuauhtémoc's defeat. The third, erected in 1993, concerns the events of Oct. 2, 1968. The 'Treaty of Tlatalolco' was signed at Mexico, Federal District, on 14 February 1967 and came into force on 22 April 1968. Mexico's tragedy unfolded on the night of October 2, 1968, when a student demonstration ended in a storm of bullets in La Plaza de las tres Culturas at Tlatelolco, Mexico City. The extent of the violence stunned the country. When the shooting stopped, hundreds of people lay dead or wounded, as Army and police forces seized surviving protesters and dragged them away. 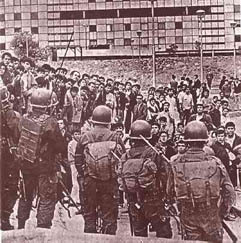 Although months of nation-wide student strikes had prompted an increasingly hard-line response from the Diaz Ordaz regime, no one was prepared for the bloodbath that Tlatelolco became. More shocking still was the cover-up that kicked in as soon as the smoke cleared. Eyewitnesses to the killings pointed to the President's "security" forces, who entered the plaza bristling with weapons, backed by armoured vehicles. But the government pointed back, claiming that extremists and Communist agitators had initiated the violence. Who was responsible for Tlatelolco? The Mexican people have been demanding an answer ever since. Director, Mexico Documentation Project. Many of the students and wounded found refuge in the church.